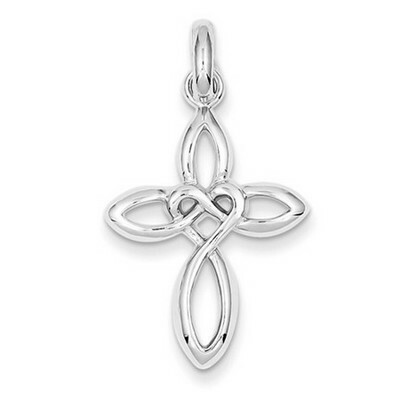 This Celtic Cross Pendant with Heart-Knot Middle in Sterling Silver is simpler than most Celtic designs, but its message is every bit as powerful. This graceful design is formed from a single strand of polished sterling silver that twists and curves to create a cross that's light in appearance but rich with meaning. A single loop forms each arm of this cross, while a heart is formed in the center where these loops intersect. As is traditional for Celtic designs, the motif that comprises this cross has no beginning or end, a quality that has caused Celtic knots to be adopted as symbols of eternity. This symbolism is especially significant as part of a cross, as it allows this pendant to serve as a celebration that the message of salvation has everlasting power. The .925 sterling silver that comprises this pendant has been given a highly polished finish that highlights it every graceful curve. Cross measures 30mm (1 3/16") x 20mm (13/16") not including bail. We guarantee our Celtic Cross Pendant with Heart-Knot Middle in Sterling Silver to be high quality, authentic jewelry, as described above.